I was pulled up today by one of our Stratagurus, this week for jumping to conclusions about Kevin Anderson, our new man in charge of NSW strata. A Nationals MP from Tamworth? Surely an April Fools joke, I wrote in the Forum. Fair enough. I was just disappointed that he wasn’t exactly plucked directly out of an inner-city high-rise’s strata committee. Better Regulation and Innovation is a babushka doll of a department – the new Minister will also be looking after Fair Trading, which incorporates apartment living in all its myriad forms – but who’s to say that the former Parliamentary Secretary for Regional Roads, Maritime and Transport, isn’t the perfect man for the job? By the way, he is the sixth male in a row to be given what is essentially a training-wheels ministry. Make of that what you will. The last woman was Labor’s Virginia Judge (preceded by now Federal MP, Linda Burney). 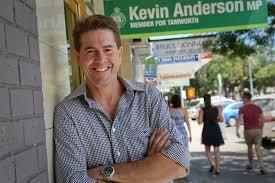 All I know about Mr Anderson, apart from that, is that he’s a Nationals MP from Tamworth who used to be a journalist. Given that any MP from Tamworth is pretty likely to be a Nationals member, we can’t hold that against him … or that he used to be a journalist, for that matter. What else do we know? A quick squiz at Hansard (the official record of what’s been said in Parliament) reveals a lot of local issues, including stuff about the drought – no surprise there – but, unexpectedly, last year he pitched in to the debate about whether or not pro-life protestors should be allowed to approach women entering abortion clinics to offer “counselling”. Given his conservative political allegiances, you may be surprised to read that he was in favour of the clinics’ clientele being allowed to enter unimpeded. That said, he made it clear that it was not because he was pro-abortion (that distinction was neither made nor denied) but because he’s pro law and order. Also somewhat belying his political connections, has spoken in praise of a renewable energy farm in Manilla, in his electorate. “I congratulate … everybody who is part of the sensational push to create a source of cheaper renewable energy at a price that is acceptable to both consumers and the environment,” he said in October last year. But what does he know (or, indeed, care) about strata? I hope to find out for myself by having a chat with him as soon as he has his feet under his new desk. Until then, I will reserve judgement, rushed or otherwise. Meanwhile, elsewhere on the Forum you will find a call for urgent help to deal with a neighbour who is installing timber flooring in defiance of a by-law. What can you do? One of our stratagurus has an answer HERE. Can an owner install their own video camera, filming what’s going on in common property? That’s HERE. Coincidentally, the same week we ran our Financial Review column on naming, shaming and defaming, a Flatchatter asks if a strata manager should ignore a request for privacy from a resident with whom the scheme is in dispute, by publishing their name in minutes? That’s HERE. You’ll find a lot more question and answers, problems and solutions, on the Flat Chat Forum. THE NEW MINISTER. Yes, he is new, let’s give him a go as he is NOT tainted by factional ownership, I understand him to be a true conservative, thus he has core beliefs, unlike the all powerful grubby moderates, that believe in nothing! The last minister, Matt Kean, nice bloke, however is a wholly owned member of the all powerful MODERATES … directed by the faceless man Michael Photios. Gladys ran it this handed over to the joint leadership of Matt Kean (NSW) & Trent Zimmerman (Fed) this faction lives in the swamp, doing … deals with the sell out Alex Hawke little right faction, so look carefully at what you have lost, then welcome the possibility of a decent good new minister.